Yonge Street is by far my favourite display of the Cavalcade of Lights, and was also the toughest to shoot. 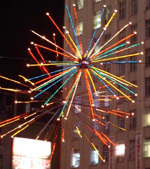 The display in Dundas Square features gorgeous overhead light bursts that change colour, and lines of lights along the north canopy also flash in sequence. 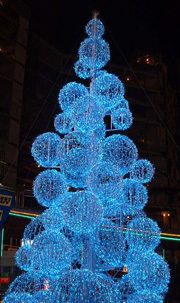 The tree-like structure made up of a variety of globe-like shapes is the most striking as it modulates from white to light blue and then a very dark blue and back to white again. Over the street, light swags of shades of blue and purple run from Dundas down to Queen Street West where the Hudson's Bay Company, although not part of the official event, become a important part of the display as enormous light grids on the corners of the building flash video images of snow flakes, holiday messages and the Bay logo down onto the street. If you're a holiday curmudgeon still looking for your Christmas spirit, may I suggest a walk along Yonge Street with a cup of hot chocolate and some carefully chosen holiday tunes on the ol' MP3 player? Despite the nearby Eaton Centre and the incentive to get all crazy consumer, it just might be where the Christmas spirit finally catches up with you.